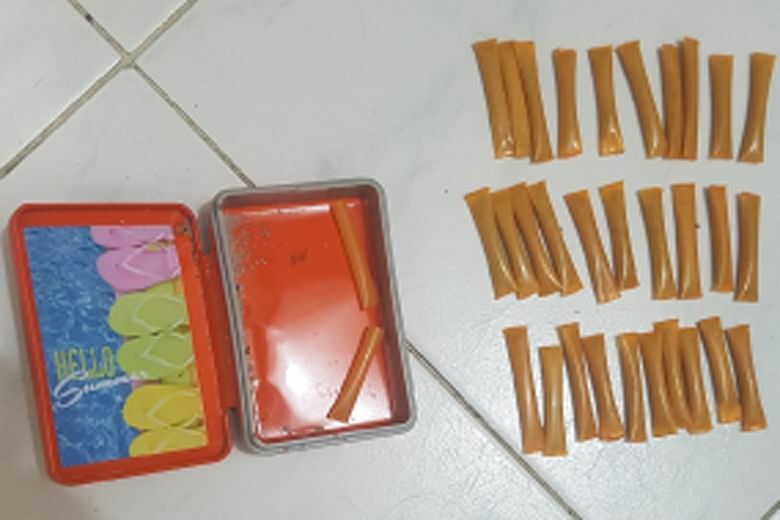 SINGAPORE - Two suspected drug traffickers were arrested in Downtown East during a seven-day islandwide operation by the Central Narcotics Bureau (CNB). On Monday evening (April 2), CNB officers arrested a 24-year-old woman and a 27-year-old man, both Singaporeans, in the Downtown East area. They recovered six "Ecstasy" tablets and two Erimin-5 tablets from the woman, and 97 "Ecstasy" tablets from the man. Investigations found that the woman was renting an apartment in Outram, and officers raided the apartment, recovering about 315g of cannabis, 5g of "Ice" or methamphetamine, 11 "Ecstasy" tablets and two Erimin-5 tablets from the apartment. The pair were part of 91 suspected drug offenders who were arrested in CNB's operation, which began on March 30. The operation, which was supported by the Singapore Police Force, covered areas including Bedok, Bukit Batok, Chai Chee, Clementi, Hougang, Jurong, Pasir Ris, Redhill and Tampines. CNB seized a total of 434g of cannabis, 335g of heroin, 54g of "Ice", 114 "Ecstasy" tablets, 64 Erimin-5 tablets, two pieces of LSD and a "Yaba" tablet in the operation.